Before the summer completely winds down, I want to offer a recommendation for one of the books from my summer reading list. 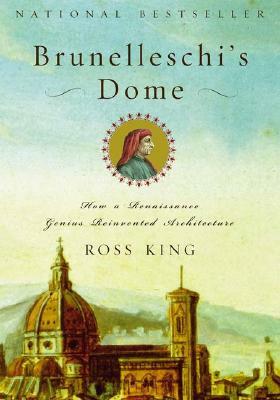 It was in part by chance that I picked up a copy of Ross King’s 2000 national bestseller Brunelleschi’s Dome: How a Renaissance Genius Reinvented Architecture. But it was also from a desire to expand my understanding of this pivotal structure after having studied it firsthand in Florence with the Syracuse University study abroad program, some 15 years ago. If there was ever one place to be, at one moment in time, to witness the biggest technological and aesthetic breakthroughs in architecture, it has got to be Florence, Italy in the Renaissance years of the 15thcentury. The home of the greatest revolution in art and architecture, the Florentine Renaissance produced works by Michelangelo, Botticelli, Raphael, Leonardo da Vinci and Dante. And towering above them all stood the Santa Maria Del Fiore, Florence’s central cathedral that was built to rival all others. The dome that sits atop the cathedral was the widest ever built at the time, with a diameter of 143 feet, and the highest, topping out at 350 feet above street level. It remained the largest such structure for almost 500 years and today remains as the largest brick-and-mortar dome in the world. 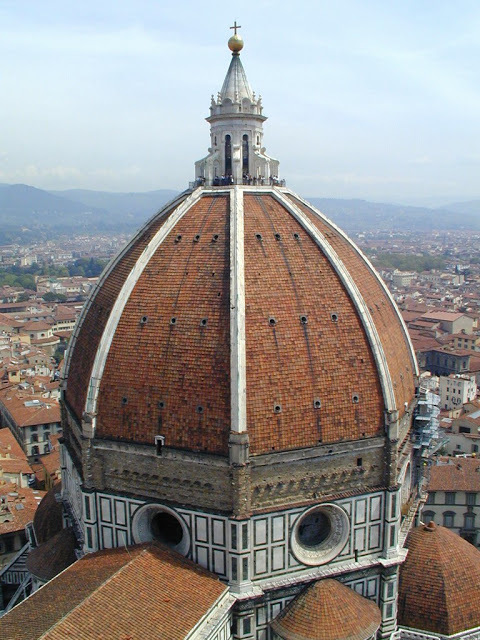 The Opera del Duomo, the guild of wealthy Wool Merchants who were responsible for building and funding the cathedral, had selected a design for the cupola by Neri di Fioravanti. Most gothic cathedrals of the time relied on flying buttresses – external structural supports that braced the outside of the basilica. But Neri’s design did away with this external bracing that many in Italy considered ugly and burdensome. Instead, the proposed design relied on a series of stone and iron chains embedded inside the double-skinned dome to prevent it from collapsing upon itself. The result was a structure that seemed to rise majestically without any visible means of support. This single aesthetic decision ushered in the Renaissance and marked the end to the Gothic age. A concept model was in hand, but no one actually knew how to build it. So a structural design competition was held in August 1418, and by the following month the project was granted to a goldsmith and clockmaker, Filippo Brunelleschi. 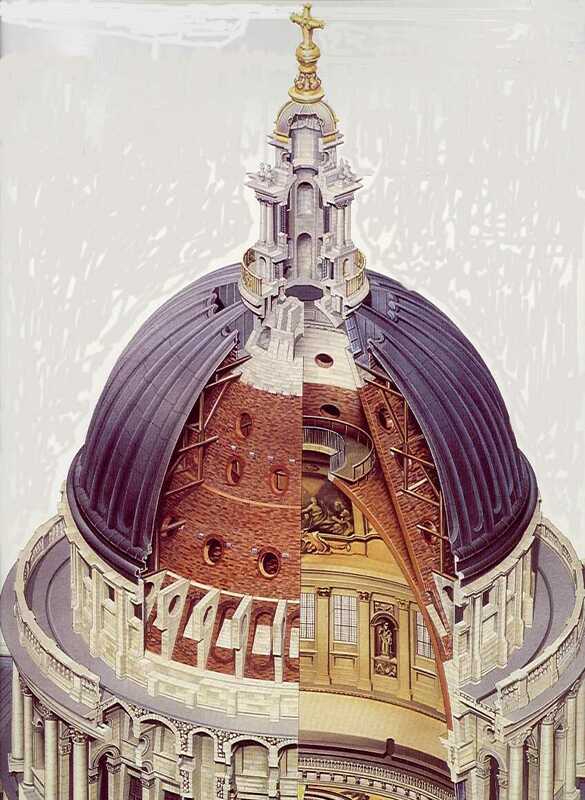 Soon named the Capomaestro of the project, or architect-in-chief, Brunelleschi solved the biggest technological challenges to the dome’s construction. An ingenious designer, engineer, and inventor, Brunelleschi came up with a number of supporting devices and concepts that were instrumental in the dome’s construction. Facing the primary challenge of transporting 70 million tons of building materials and lifting them several hundred feet above the ground, he invented an ox-hoist that was assembled on the cathedral floor. With his machine, one ox could raise a load of 1,000 pounds to a height of 200 feet in approximately thirteen minutes. Brunelleschi also solved the problem of how to build the dome without wooden centering supports. He is credited with inventing linear perspective, and he holds the first-ever patent for invention for a ship used to transport building materials up the river Arno, a precursor to today’s paddleboats. Repeatedly subjected to public scrutiny, doubt, and even jailed by his enemies at one point, his career was marked by breakthroughs and setbacks. He was engaged in a bitter rivalry with his lifelong competitor, Lorenzo Ghiberti, and was constantly entering competitions to prove his worth. His final competition reward was for the lantern that tops the dome. The cathedral was finally completed with the placing of the copper ball atop the lantern in 1496, over 80 years after the competition for the dome was called in 1413, and 200 years after construction had started on the main basilica. Ross King’s book goes into intricate detail of the structural and engineering feats by Brunelleschi, but is nonetheless a compelling story of human dedication, political posturing, and rival competition during a time of plague and war. The book instills a real appreciation for the Duomo – just as much an artistic achievement as it was a structural one – and for the Master Architect who made it all happen.